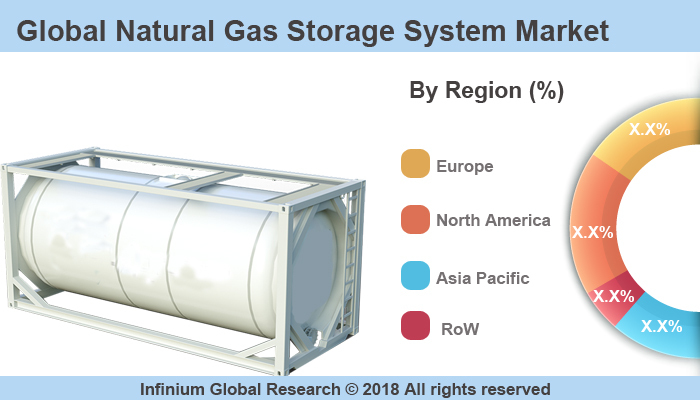 A recent report published by Infinium Global Research on natural gas storage system market provides in-depth analysis of segments and sub-segments in global as well as regional natural gas storage system market. The study also highlights the impact of drivers, restraints and macro indicators on the global and regional natural gas storage system market over the short term as well as long term. The report is a comprehensive presentation of trends, forecast and dollar values of global natural gas storage system market. According to the report the global natural gas storage system market is projected to grow with a healthy CAGR over the forecast period of 2018-2024. Natural gas is a basically colorless and odorless gaseous form of hydrocarbons that are stored in various underground and above ground facilities. The depleted reservoirs in oil or gas fields, aquifers, and salt caverns are the underground facilities used to store the natural gas. Storage of natural gas reduces the risk of interruption in service as a result of technical, political, or other problems in the course of delivery. The fluctuating Seasonal demand for natural gas is covered by the stored gas. According to EIA, Working gas in storage was 2,354 BCF on August 3, 2018. The natural gas is vastly used in the automobile industry as an alternative fuel. The rapidly growing demand for natural gas across the world owing to the increasing demand for fuels for industrial applications and transportation is the key factor driving the growth of the natural gas storage market worldwide. The production and exploration of natural gas is time consuming process so the stored natural gas is able to fulfill the requirements of natural gas that are likely to boost the demand for natural gas storage system market. In addition, the growing production of natural gas is creating a huge demand for the natural gas storage system that is escalating the growth of the natural gas storage market. However, the strict government regulations on the safety of natural gas storage system may hamper the growth of the natural gas storage system market. The natural gas storage imposes high risk and the construction of storage and operation facilities for the gas storage is quite challenging. The small mistake can create huge and massive problems in the case of natural gas storage. Moreover, the rapidly growing demand for natural gas for applications and vast production of natural gas are expected to crates several opportunities for the natural gas market over the forecast period. Geographically, Europe holds the maximum largest share in the natural gas storage market owing to the large consumption and the production of natural gas in this region. In addition, Asia Pacific is the fastest growing region in the natural gas storage market. The huge demand for natural gas and the availability of raw materials are the factors driving the growth of the natural gas market in the Asia Pacific region. The report on global natural gas storage system market covers segments such as type. On the basis of type, the global natural gas storage system market is categorized into underground storage and above ground storage. The U.S. drives the growth in the North America region as it is the largest market in the region. The Asia-pacific region offers substantial potential for the market growth owing to rapid growth in markets such as India and China. The APAC region is projected to experience growth at a CAGR of x.x% over the period of 2018-2024. The report provides profiles of the companies in the global natural gas storage system market such as John Wood Group PLC, Chiyoda Corporation, Enbridge Inc., Mitsubishi Heavy Industries Ltd, Rockpoint Gas Storage, Cardinal Gas Storage Partners, CB&I, SNC-Lavalin, Engie SA, and Others. The report provides deep insights on demand forecasts, market trends, and micro and macro indicators. In addition, this report provides insights into the factors that are driving and restraining the global natural gas storage system market. Moreover, IGR-Growth Matrix analysis given in the report brings insight into the investment areas that existing or new market players can consider. The report provides insights into the market using analytical tools such as Porter's five forces analysis and DRO analysis of natural gas storage system market. Moreover, the study highlights current market trends and provides forecast from 2018-2024. We also have highlighted future trends in the natural gas storage system market that will impact the demand during the forecast period. Moreover, the competitive analysis given in each regional market brings insight into the market share of the leading players. This report will help manufacturers, suppliers and distributors of the natural gas storage system market to understand the present and future trends in this market and formulate their strategies accordingly.